Is it seriously already Friday?! It feels like this week flew by. That's always how it is during the fall + holidays though, right? I mean it's hard to believe that next weekend is Halloween!! Weren't we just celebrating the beginning of fall? I feel so behind this year y'all. I have barely decorated the apartment, have only made one fall recipe, haven't even made my mom's chili or carved a pumpkin! We've even had our first frost here in DC, and none of these things have happened yet. Crazzzzy! The only thing I have managed to do is visit my favorite local orchard and pumpkin patch. Tonight I'm celebrating a friends birthday, tomorrow cheering on the Vols (hopefully to another victory) and Sunday I'm going to my first Redskins game. Although I'm not a fan of my hometown team, I'm definitely excited to attend my third NFL game. The Tory Burch Private Sale is here! Shop and save up to 70%. Great news!! H&M just got added to rewardStyle and LikeToKnowIT!! So you can now shop H&M pieces directly from my blog posts, social media and Instagram! Seeing as well over half my wardrobe is from there, this is great news for you and me! Some of the popular Tory Burch shoes and purses are on MAJOR sale!!! Save up to 70%! New favorite cable turtleneck sweater!! Comes in ten colors too! Save up to 60% on fall staples at H&M and 30% on their home decor! How amazing are these wedge booties?! They're on major sale too! The cutest coffee mugs for the holidays! Would make perfect gifts for your friends or coworkers! Adding these wine colored lace-up flats to my closet asap! Who doesn't love a good bay leaf wreath or garland for the holidays?! Shop early to save 20% and have your items delivered right after Halloween so you can enjoy them all holiday + winter long! ICYMI: The Star Wars trailer was released this week and looks epic! Rent the Runway CEO and founder Jennifer Hyman talks about her nightly routine and things she does to help unwind from the day. Great tips for all you Girl Bosses out there! Gilmore Girls will no longer just be reruns on Netflix. Soon, you'll see something new! Think being a blogger is all glitz and glamour? Sometimes it is, but there's a LOT that goes into it. Here's a behind the scenes take on being a blogger. Hint: it's a stressful, time consuming thing. ABC Family released their 25 Days of Christmas schedule this week! Eekkk, can't wait! A surprise episode of Wine About It Wednesday with Matt Bellassi went up this week!! This time... tackling the worst things about skiing! The Draper James flagship store opened this past week! Take a peek inside Nashville's newest boutique! J.Crew Puffer Vest // brand new outfit post from this week! Over the Weekend, Butler's Orchard // photos from my afternoon at a local pumpkin patch and apple orchard! Definitely a must read for anyone in the DC area. Photo is via my FALLing in Love Pinterest board! 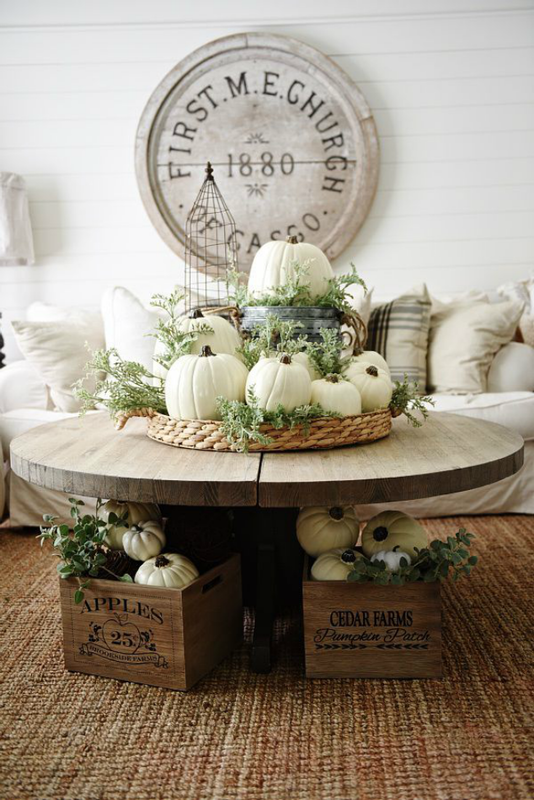 See more fall decor + home inspiration here.